Are you a foodie? Are you an adventurous diner? Will you try everything from food trucks, restaurants where the locals go on up to gourmet dining? Do you love wine or craft beer? Do you plan your vacations around food? If you answered yes to some of these questions, then you might want to consider a Culinary and Wine Vacation Experience! What is Culinary and Wine Tourism? Studies have found that the percentage of North Americans travelers who choose a destination based on its culinary offerings has increased drastically in the last couple of years. It’s no wonder, with all of the cooking shows on TV and the zillions of pictures of food on Instagram and Pinterest, the interest in culinary tourism has sky rocketed. How can a culinary or wine experience be a part of your vacation or honeymoon? 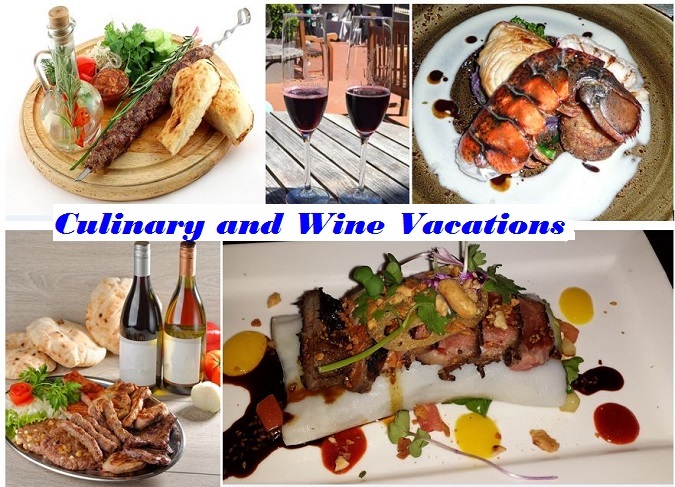 My Vacation Lady has partnered with some wonderful suppliers who can help add a culinary experience or two to your honeymoon or vacation or we can arrange an entire culinary vacation. Cooking classes– these can be a group experience at a culinary institute or a cooking class in a local home. You’ll learn to prepare one dish or a four course meal, and then, of course, you’ll get to eat it. Some will be paired with local wines. Food Tours – can include visits to local markets, to hands on cooking classes, demonstrations and tastings, winery visits and wine tastings and more. You can visit local taverns, “hole in the wall” restaurants where the locals eat, visit distilleries, hunt for truffles in Italy, France or Croatia, experience a CouCous festival in Sicily or dine at some of the top restaurants in the world. Food Tours can be from a single day to a multi week experience. Urban Culinary Adventures- may be a wonderful combination with your sightseeing or cultural exploration. Take a pub crawl in Dublin or a taco crawl in Mexico City. Eat your way around the food stalls at Burough Market in London or take a walking food tour in Honolulu. We can create an itinerary around your culinary adventure! Beer, Wine and Spirit Tastings- if all of this talk about food has made you thirsty, you can see why tours for spirits, beer and wine are extremely popular. You can do a Whiskey Tour in Scotland, a Craft Beer Tour in Germany, a Pisco tour in Santiago, a Napa Valley Wine tour or even drink your way down the Kentucky Burbon Trail. These tours can teach you about the art of the beverage by visiting the pubs, distilleries, vineyards or shops that are best know for the specific drink. Culinary or Wine Cruises- follow your favorite chefs or watch a cooking competition on board a cruise ship. Take a Wine Themed River Cruise down the Danube, Duoro, Mosel, Rhine, Rhone and Seine Rivers in Europe. You can enjoy lectures, tastings and optional private tours to renowned vineyards & world-class wineries while in port. When on board, you can enjoy an extensive selection of fine red & white wine pairings with both lunch and dinner. On select luxury cruises, you might be able to experience unique cooking school concepts which may include cooking demonstrations, lunch and learn, market to plate, cooking competitions and knife skills workshops. If this sounds like something that you would be interested in, My Vacation Lady can help plan your vacation or honeymoon around a specific culinary experience or offer you some unique culinary activities. Let My Vacation Lady help plan a memorable trip for you. Call now (732) 418-0819 or or send us an email.